The event data collection (referred to as contactactivites in the database) contains behavioral data records for all contacts in the system. These include standard message events (sends, opens, clicks, etc. ), custom named events associated with website behavior (browse, cart) as well as external events captured by IoT devices (opened door, triggered alarm, etc.). Each event is associated to a contact via the contact's primary key (contact's email address). Event data can be used to personalize content in a message, build an audience, trigger message sends and build analytics reports. The above example shows 3 events associated with the same contact: a browse event, a message sent, and a message open. The events associated with a message contain additional information about the message and the browse event shows additional information about the product that was browsed (title, price, etc). Note: All event activity is stored in Cordial for 18 months. Message opens and clicks are tracked for 30 days from the time of a message send, after which tracked links will expire. You are able to request a default URL (such as a home page) for expired tracked links by contacting your Client Success Manager. Message event data (send, open, click, bounce, etc.) is created and stored automatically in the system when a message event takes place. Custom named events are created by you according to your marketing strategies. 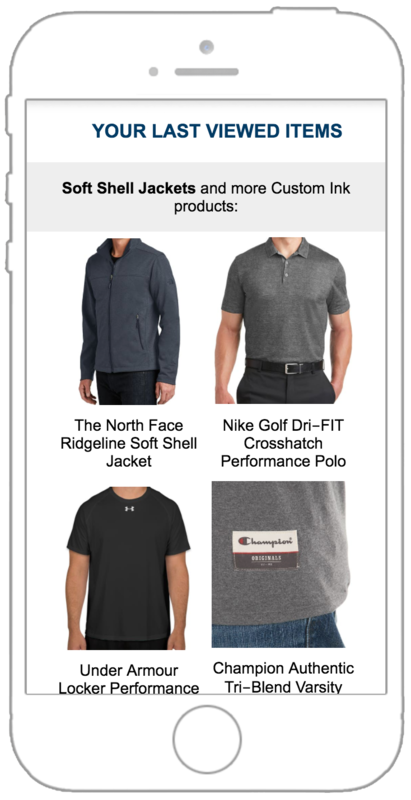 For example, in order to send your subscribers a cart abandonment message, you need to create a custom named event with a name like "cart" to be used as a trigger to send an email when a contact adds an item to their cart. In this scenario, you would likely create another custom event called "order" that would be used to cancel the cart abandonment message should the contact complete the purchase. Note: Learn how to create a cart abandonment message. You can also create custom named events to track browse behavior on your website. These browse events can be used to trigger a browse abandon message in the event that a contact leaves your site without purchasing. Note: Learn how to create a browse abandon message. There are countless opportunities to trigger personalized messages based on custom events. Custom events can be created for when a video is viewed, a PDF is downloaded, or an article is liked. Custom events can also be created based on IoT behaviors such as triggered an alarm, or opened a door. The options are literally limitless. Custom events contain the name of the event (browse, cart, order), as well as the optional properties associated with that event such as a URL, images, descriptions, etc. Event data is viewable in the UI or via the API. To view event data in the UI, navigate to Analytics › Event Data Reports. You are able to filter the report results by event type, contacts, audience rules and date ranges. Event data is also viewable via the API. You can make an API call to view all events or filtered events. You are able to export event data via the UI or via an API call. 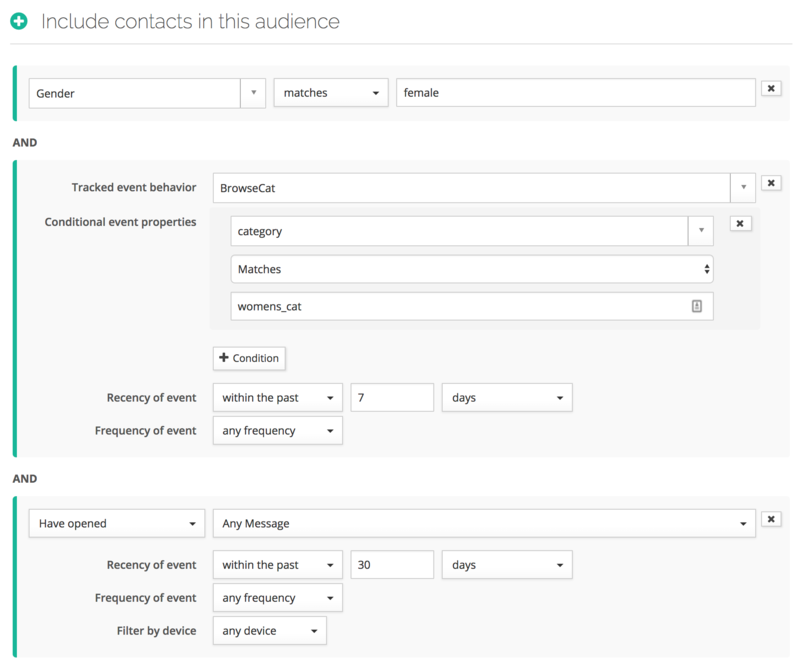 Message content can be personalized based on a contact's event behavior using the Smarty getEventRecords method. With Smarty, you are able to query event data per contact, filter and sort records, then display the event and its associated properties in a message. This is useful in browse abandon campaigns where a contact viewed items on your web site but failed to add anything to the cart or make a purchase. You could trigger a message via a browse event, then display the last 4 items they browsed in the message. Using the Audience builder you are able create audiences based on message events and custom named events. You can combine audience rules and create complex queries such as: "Show me all females that browsed the women's category in the last 7 days and opened any message in the past 30 days". With message automations you are able to trigger message sends based on custom named events. For example, if you have an event called browseCat that contained a property called womens, you could trigger a message when that event is passed to your account. 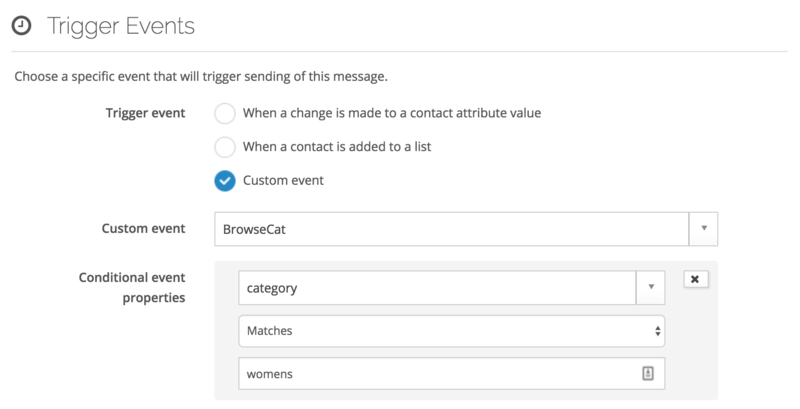 To trigger an automated message based on a custom event, use the Event Triggered sending method, and choose the Trigger Event: "Custom Event". Both system events and custom named events can be visualized over time using event dashboards. You can also create event data reports for viewing and exporting all events as a report. You are also able to view audience populations based on events with audience trend reports. Using audience trend reports, you can view the population of an audience over time based on an event such as website browse activity. For example, you can create an audience of contacts that have browsed the shirts category, save the audience with audience trend analytics enabled, then view the population over time on an audience trends chart. Event dashboards provide a way to create multiple charts of time-based event activity. This allows you to compare contact behaviors on your website with message activity, for a holistic view of your marketing performance. You are able generate a report of all events passed to your account on the event data reports page. This provides you with a log of all events in chronological order. You are able to filter the event report by event type, contact, audience and date range, as well as download to your local computer or a remote server. In the next article learn about products.